Since my last update, I was supposed to be doing character concept art, but I got VERY sidetracked. At least it was a productive detour. I did get SOME concept art done before veering off on a tangent. Mainly, I gave Serena’s outfit a makeover. After I started doodling some of the other characters’ sprites, I noticed that she had significantly less detail than the newer ones I was drawing. So I upped the detail on her outfit to match the rest of the cast. She also got an extra color in her palette, a dark blue. Again, this was so that she would have the same level of detail in the color department as the other characters. Here you can see the before and after doodles. I’ve learned something interesting about designing characters for games that contain both low resolution and high resolution versions of said characters. As it turns out, it’s much easier to start with the low res version first and work your way up. The hardest part with tiny characters is making sure that they have readable silhouettes. The human sprites all fit within a 128×128 pixel square, so that isn’t much room to work with. I originally started with a character found later in the game. I drew the high resolution version first, only to find out that the design didn’t work at all when shrunk down to 128×128. I’ve done a few more characters starting low to high after that instead with much greater success. While taking a break from drawing concept art, I started playing around with the idea of using 3d models with ink and paint materials to mimic hand drawn sprite animation. I began with just a sphere and some bent cones over it to represent a head of hair. The materials were behaving the way I wanted them to, so I decided to take it a little further. One thing led to another. Before I knew it, I had Serena modeled and ready to go. At first glance, you probably wouldn’t assume this was a 3d render. Upon closer inspection, however, the stiff T-pose and perfectly straight ribbons give that away. 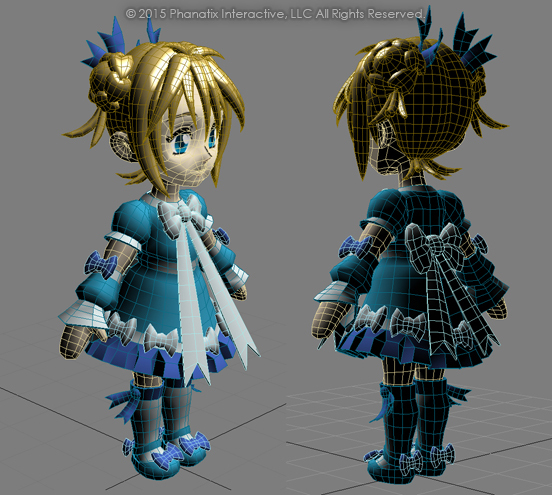 She’s currently not rigged or vertex weighted for movement… yet. Being able to do a humanoid sprite character using ink and paint materials is kind of a personal victory for me. The last time I tried this technique a few years back, it didn’t turn out AT ALL. This time around, I’m quite pleased with the results. 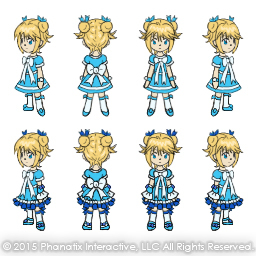 Why would I want to make all my character sprites as 3D models instead of just drawing them by hand? If you know anything about animation, then you know that 3D animation is much more forgiving than 2D. Want to move the camera over slightly? In 3D, you just move your camera and re-render the animation frames. In 2D, you would have to completely redraw the whole animation from scratch. What if you wanted to copy that character’s new angle onto a hundred other characters? If it’s 3D, then no problem: import the new camera settings and re-render it. If they were hand drawn, each of those characters would need to be redone from square one. Doing things in 3D is a time saver in the long run, even though it takes longer to create the assets up front. Since my background is primarily 3D modeling, this route takes advantage of my own strengths better. Which is important when you’re working solo. After my last update, I had gotten some comments about what the environments should look like, so I figured I’d do a little tilemap test. I picked the most abundantly used tile, which happened to be the grass tile. Here you can see what it looks like thrown underneath the character turnaround. She contrasts nicely in the soft greens, though I need to figure out a system for shadows around the characters’ feet so they feel more grounded. But that’s a task for another day. Below is what the game looks like when the new grass tile is dropped in (yes, the old version of Serena is still in there). As you can see, just changing out one tile drastically alters the appearance of the game. 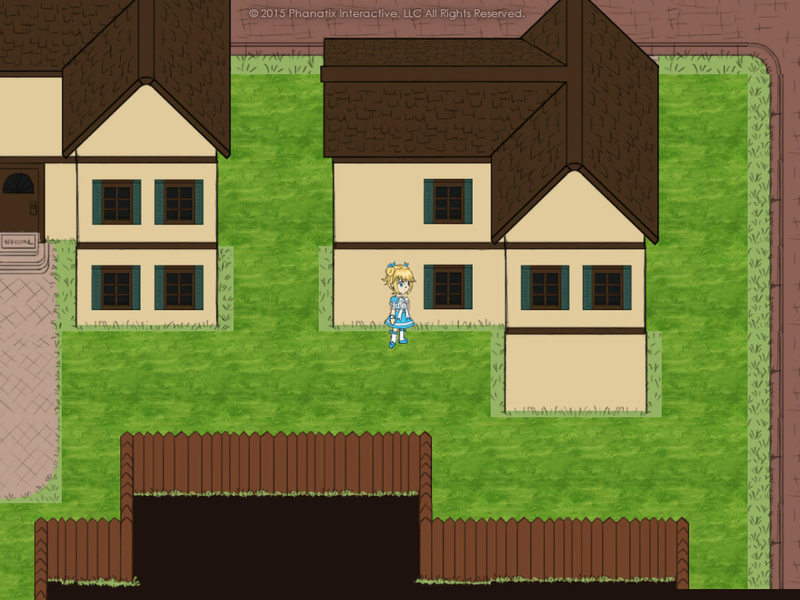 Although having one detailed tile amongst a city of placeholder art just looks silly right now. Even though it’s just one character and a patch of grass, I feel this art test has laid the groundwork for the final visual style of the game. Piece by piece, it’s starting to look like the game I imagine it to be. In the next post, we’ll be taking a look at some of the other characters in the game. Introduction to the next game: it's a JRPG! Want to support an indie start-up? You can help keep our business running smoothly by donating today! Click here for details on how we use donations. © 2017 Phanatix Interactive, LLC All Rights Reserved.